Its rules are bizarre and its organization is confusing, but quirky Pike Place Market continues to be central to Seattle’s identity. All photos by Navid Baraty. Illustration by Lori Kelley. 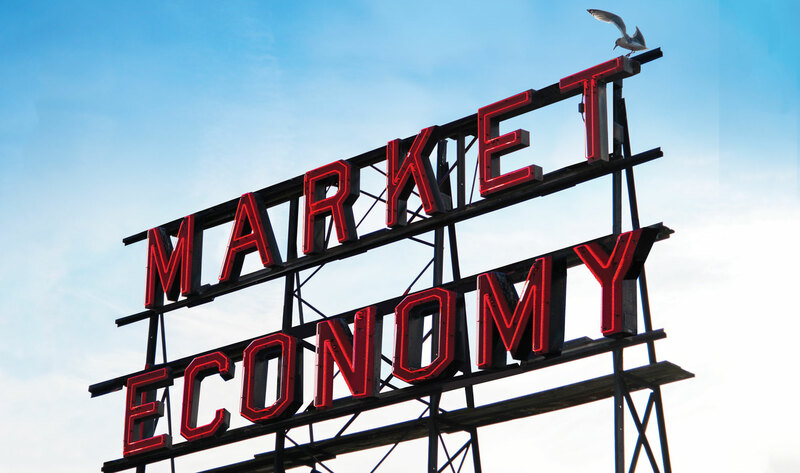 This article appears in print in the March 2018 issue, as part of the cover story, "The Pike Place Market Economy." Click here for a free subscription. Every morning before Pike Place Market opens, a genial giant named David Dickinson, the city’s official market master, makes his way through a throng of waiting farmers, flower sellers and artists congregating at the north end of the Main Arcade. Standing in front of a whiteboard bearing a schematic representing the 200-plus day stalls in the market, Dickinson proceeds to assign spaces to vendors who signed up earlier that morning. At precisely 9 a.m., he rings a brass hand bell to declare the market officially open. Such authenticity doesn’t come easily. It’s embodied in dozens of old buildings that require constant and costly maintenance. It’s expressed in the quirky yet delightful restaurants and stores scattered across a warren of arcades that must be curated for diversity and uniqueness. It’s revealed in market-subsidized homes for seniors, day care for toddlers and a food bank for the needy. And it’s safeguarded by a complex management structure that boggles the mind. The market’s origin is basically rooted in European village markets but with a nod to the unfamiliar sights and exotic smells of the souks and medinas of the Mediterranean rather than the polished and new (or “repurposed”) gentrified markets like Boston’s Faneuil Hall and San Francisco’s Ferry Terminal. How has Pike Place Market survived when far more legendary markets have fallen by the wayside? Les Halles, a massive fresh-food market in the middle of Paris that was established more than 800 years ago and described by novelist Emile Zola as “the belly of Paris,” was dismantled in the 1970s to make way for a modern shopping mall. How does the market’s distinctive blend of socialism and capitalism — some call it communitarian capitalism — manage to resist the siren call of commercialism in favor of preservation while staying vibrant enough to attract 15 million visitors a year? Technically, the “Market” is a 9-acre zone roughly two blocks wide by four blocks long. Its day-to-day operations are administered by the Pike Place Market Preservation & Development Authority, better known as the PDA. The PDA manages 24 buildings, most of which it owns. It employs 29 full-time employees to service the buildings, which date back to the 1920s. Established by the city in 1973 as an independent nonprofit, the PDA selects merchants when space opens up and enforces rules, but is accountable to the market community, which includes merchants, day-stall tenants, buskers and occupants of the 500 market-owned residences. It is governed by a board of 12 private citizens, with four members each appointed by the mayor, the PDA council and elected members of the market community. Like the CEO of a multimillion-dollar enterprise, the PDA’s executive director is expected to articulate the market’s vision and to act as final arbiter in internal disputes. This requires a refined sense of cultural awareness and business competence, as well as an ability to communicate within the market’s multicultural environment. Mary Bacarella stepped into the role in January, succeeding Ben Franz-Knight, who resigned last October after seven years at the helm. One of Bacarella’s goals is to place renewed emphasis on attracting more local residents to a venue that can sometimes seem overrun with tourists, especially in the summertime. MARKET FORCES. Market master David Dickinson, left, rings a bell at the start of business every day. The market is generally understood as encompassing the broader 22-acre Pike Place Public Market Historic District, of which Pike Place Market is the core. While the PDA owns and rules most of the core, it operates under guidelines set by the 12-member Pike Place Market Historical Commission, which is appointed by the mayor and reviews all design and use changes within boundaries of the district. The historical commission has in-depth conversations about everything from changing a sign to what’s on a menu, notes Crawford. For example, the commission denied Starbucks’ request to sell pastries and sandwiches in its market store but it did allow the shop to sell unwrapped cookies. When Ellenos Real Greek Yogurt opened in the distinctive Corner Market building in 2013, Franz-Knight says the owner wanted the storefront to face south. That would have placed the yogurt vendor shoulder to shoulder with a grocery stand that has been there for a century and helped define the look of Pike Place Market. The commission decided a yogurt stand would undermine that aesthetic and required Ellenos to face west instead, looking across Pike Place toward the Main Arcade. Not surprisingly, the market’s method is not a formula for financial success. The PDA’s annual revenue on its 250,000 square feet of leasable space came to about $11.5 million in 2017, roughly $46 a square foot per year. The PDA makes an additional $3.6 million annually from its parking garage. Add revenue from the residential units it rents out and other incidental income and total revenue last year came to $19 million, up a modest 20 percent since 2013. Three-fourths of that amount pays for tenant services, including maintenance, security, insurance, utilities and property management. About $2.1 million in “surplus revenue” goes into a reserve to fund capital projects in the market. Where the market was once surrounded by strip joints such as Deja Vu Showgirls and The Lusty Lady, known for the outrageous puns on its marquee (“Thanks for the Mammaries”), its neighbors now include luxury hotels like the Thompson, the Four Seasons and the Inn at the Market. Showgirls is still around, but the building that housed The Lusty Lady is becoming a 43-room boutique hotel and celebrity bartender Erik Hakkinen plans to open a cocktail lounge called Pink Lady at its base. For all its hawkers and crushing crowds, the market doesn’t operate much like a market. Three-fourths of the 500 or so residential units it owns are leased to low-income residents, mostly seniors, for between $150 to $791 a month — a nod to the market’s early days as a home to many low-income residents. Retail tenants are chosen based on a mysterious formula that includes such things as how unique the store is, what the space had been used for in the past, whether the products are sourced locally and whether the store represents a new concept. Chin Music Press leased space at a reasonable cost because the market wanted a local publisher on the premises. Lease rates, too, have their own special rules. Stores that primarily serve local residents selling such goods as vegetables and meat pay as little as 2 percent of their sales revenue in addition to a low base rent. More successful, better-situated stores pay as much as 6 percent of sales. Although the market’s mission is to support small and marginal businesses, it has nonetheless created more than a few large, successful ones. Starbucks did not start out in the market, but it was after it moved there and was acquired by Howard Schultz that its star began to rise. It now has more than 27,000 locations. Shirley Collins launched Sur La Table in the market in 1972 and ran the store until she sold it to the Behnke family, which developed the business into a successful chain with 120 locations. In 2011, Sur La Table was sold to Investcorp, an offshore holding company, for an estimated $200 million. Kurt Dammeier was walking through the market in 2003 when he noticed an empty space not far from Sur La Table. While he owned some Pasta and Co. gourmet takeout stores, market rules forbade him from putting one of them in the market, so he came up with the idea for Beecher’s Cheese. If you get to the market early, before the tourists arrive, you’ll see a tanker truck hook up to a sidewalk “hydrant” and pump the morning milking from a farm in Duvall into a giant tub at the heart of the store to begin the process of making Beecher’s award-winning cheddar. Some years ago, Dammeier added a second Beecher’s location in New York City. Seattle City Council ordinance in response to farmers’ complaints that they were getting too little for their crops and consumer complaints that they were paying too much for food. Farmers parked their trucks and wagons in the crook where Pike Street turns north and becomes Pike Place, selling produce right out of their wagons. Developer Frank Goodwin bought up land and erected many of the buildings in the vicinity, including an arcade with 70 stalls that he sold to the farmers. Over time, one of the farmers, a strapping Neapolitan immigrant named Giuseppe “Joe” Desimone, bought his own stall, then another and another, until he was the de facto owner of the market by 1933. In 1940, Japanese Americans produced 75 percent of the produce in King County and made up half the vendors in the market, so it was a great blow to the market when, after Pearl Harbor was attacked, Japanese Americans were sent to internment camps in 1942. The market suffered further after World War II with the arrival of cars and supermarkets and suburban shopping centers. By the late 1960s, it was in sorry shape. In 1968, developers came up with a Pike Plaza redevelopment proposal for a hotel, a park and a 4,000-space parking garage. Seattle architect Victor Steinbrueck, one of the designers of the Space Needle, published a series of sketches of the market in 1968 but told his son the market “deserves more than a book. It deserves to live on as a link with Seattle’s past.” Seattle residents voted in 1971 to acquire the market — the PDA was chartered by the city two years later — and voted again in the early 1980s to protect it from another effort at redevelopment after a tax-shelter scheme by a group of developers soured. Today, “meet the producer” is still the market’s calling card and farmers remain at the core of the producer community. The Italian and Japanese immigrants who once dominated the market have given way to other immigrants, including Hmong families that arrived from Laos as refugees in the early 1980s. They were taught to grow flowers under the state-operated Indochinese Farm Project and now make up roughly half of the dozens of flower sellers in the market. Also of prime importance to the market are the arts-and-crafts stalls. Craftspeople must apply for a permit, which requires being screened by a panel of senior craftspeople and the crafts manager. All the art must be original and locally made, not merely assembled. The panel also looks at the uniqueness of the art or craft. The creator must show up at the stall at least once a week. Depending on day and season, vendors pay from $7 to $37 a day for the use of a four- to eight-foot stall. It’s a measure of the importance of the farmers and craftspeople and buskers that the market continues to resist closing its main thoroughfare — Pike Place — to motor vehicles. Those cars and trucks inching their way forward, whether piloted by hapless drivers looking for parking or harried vendors making deliveries, serve the secondary purpose of keeping pedestrians on the sidewalks and inside the arcades, for at Pike Place Market, you are jostled, not coddled. “Visitors come for the experience, for the diversity,” reasons Ben Franz-Knight. Take away the motor vehicles, he speculates, and business at the stalls and shops would drop by as much 30 percent.